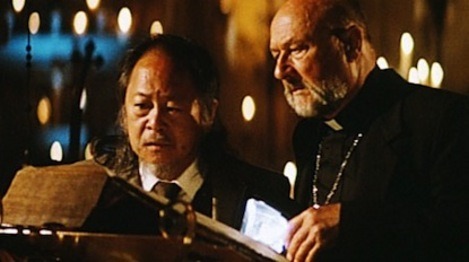 This entry was posted in Blu-Ray, Celebrity, Horror Reviews, Movies, Reviews and tagged Donald Pleasence, John Carpenter, Prince of Darkness, Studio Canal, supernatural, Victor Wong by Craig M. Bookmark the permalink. I really like Prince of Darkness, sure its not the star of Carpenter’s filmography but it has a lot going for it. I like the sense of dread and the novel slant on horror that all the Quatermass-like science gives it. Its the end of the world and nobody knows its happening, and even messages from the future cannot save us, or us save that future. I love the soundtrack score too. I wish Carpenter was still making movies like this, as if he could have been a genre Woody Allen making low-budget films every year. Ultimately the low-budget and tight schedule proves the films undoing but I’ll forgive it all that. I love the ending. Mind, I saw this back in the cinema when it was new. It might no have aged well for viewers coming to it now for the first time, but back then, it was great. Hey thanks for the comment. I still liked it, hence my 3 /5 for me just felt a little disjointed and not fully realised. However those good moments, especially the final act… are great. I initially wasn’t too impressed with the film, but the more I watch it, the more things I like about it. Like In The Mouth of Madness, it really feels like an entry in the Cthulhu Mythos.